SPARTA, IL. 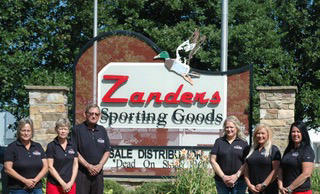 (August 9, 2018) – Zanders Sporting Goods, a national distributor located in Sparta, Illinois, proudly announces that it is now a completely woman-owned business. Long-time Zanders co-owner, Dennis Zanders, made the decision to pass ownership of the company to his daughters after 50 years in the family business. The Zanders ownership group now consists of Glenda Zanders, Kathy Zanders-Stellhorn, Stefanie Zanders, Jill Zanders-Henslee & Christine Zanders-Cox. To learn more about Zanders, visit their website at www.gzanders.com.